← No Laughing Matter! Or Is It? 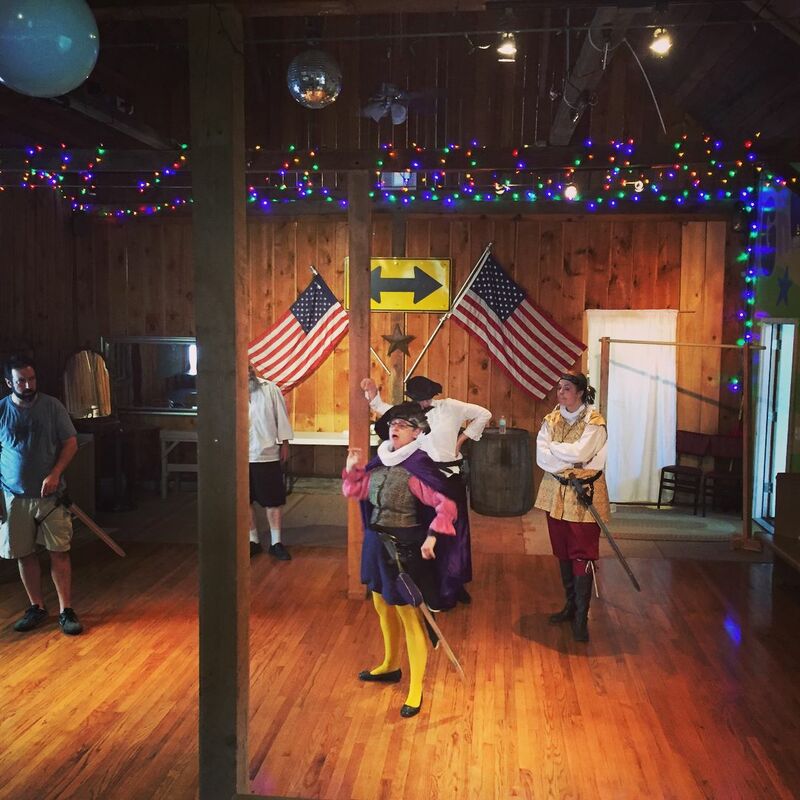 This is LiFT rehearsing The Tempest at 120 London Bridge, Caroga Lake, where we will perform on Saturday at 6 p.m. It is a donation-based performance. I’m not sure what the suggested (or requested) donation is. It is a lovely space to perform in. Incidentally, I am the one in yellow tights, Acting (yes, it needs a capital A). The photo was taken by Matt Powers, our director. I missed him on TV! 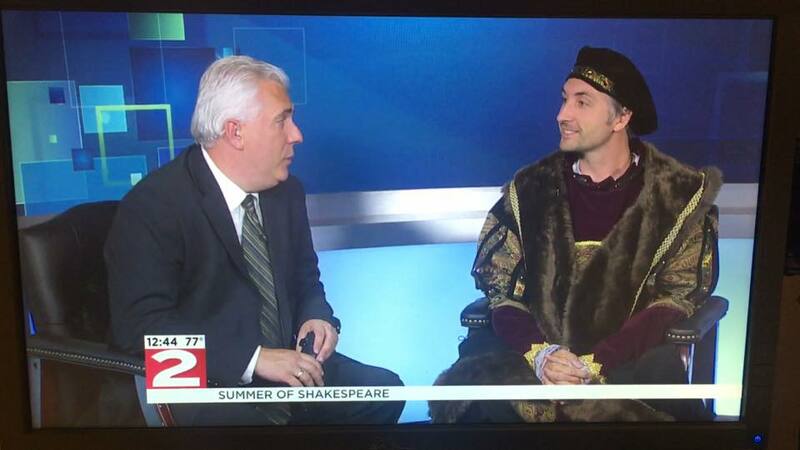 Recently, Matt went on NewsTalk on WKTV to talk about LiFt and Shakespeare. This is not what he will actually wear in The Tempest (he has two roles), but I think it was quite a theatrical choice for publicity purposes. I’m not sure who took this photo; it was on LiFTs Facebook page. To include three photos, as I like to do, here is one from early days of rehearsal, at Sterzinar Park, Canal Place, where next weekend’s performances take place. I’m the one center stage, looking fairly ridiculous in the big old hat with a sweatshirt tied around my waist. I tied on the sweatshirt not because I had tied one on (sorry; just had to make the play on words), but because I wanted something to put my sword through. We had just started working on them. I have a better looking sword holder now. 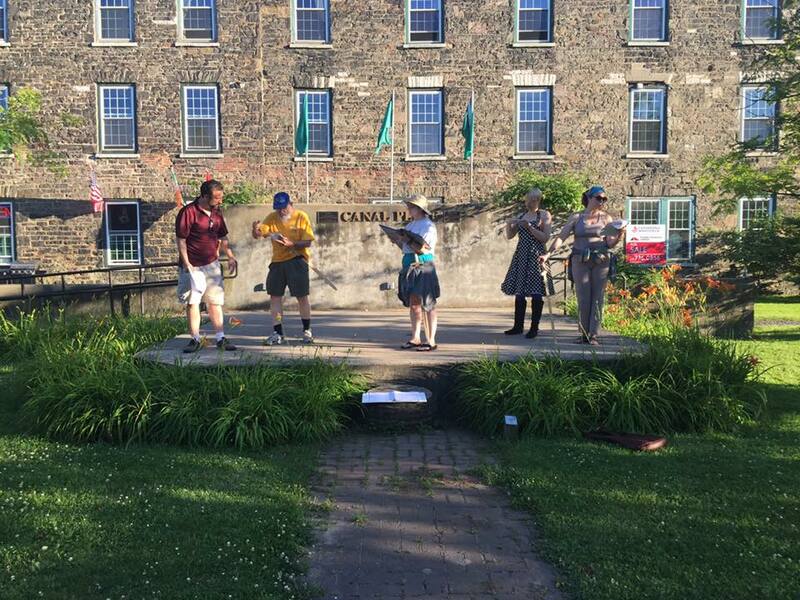 Performances of The Tempest in Little Falls include Aug. 10, 6 p.m., Benton’s Landing; Aug. 12, 4 p.m., Sterzinar Park; and Aug. 13, 3 p.m., Sterzinar Park. For more information, check out LiFT’s Facebook page. Posted in humor, Non Sequitur Thursday, personal and tagged blog post, blogging, community theater, LiFT Theatre Company, pictures, stress, The Tempest, theatre. Bookmark the permalink. [ Laughs ] That rehearsal looks interesting! All our rehearsals are interesting. I could write blog posts about each one. Maybe for the next play I will! [ Smiles ] Oh, that would be a treat!